… the authenticity of the video is in question. And if it is legit, this is more of a “Look what I can do with my iPhone” sort of deal. Also how many hoops do you have to jump thru just to play a crippled version of Super Mario Brothers on an iPhone? Amazingly the guy survived the impact. If you watch the video closely, you’ll notice the driver of the car was talking on his cell phone, and was even weaving out of his lane. Thinking about remodeling or just changing the layout of a room in your house? Floorplanner.com might come in handy. Professor Ulf Leonhardt and Dr. Thomas Philbin, from the University of St. Andrews in Scotland, have worked out a way of reversing the Casimir force so that it repels instead of attacks. August 6, 2007 Posted by Mike | News, Science and Technology	| Comments Off on Wingardium Leviosa! If any of you out there is thinking about hiring a programmer, read this article first. It’s very very true. We’re not talking about customer service representatives or sales people here. Just having a body to fill the seat is not, I repeat not, always a win for the company. Sub-standard programmers drag down the efficiency of your other developers with beginner questions, poor comments/documentation, and bad code that someone else will later be forced to spend time fixing. Companies need to stop thinking about their developers as cogs in the machine. They are more akin to artists, authors, designers, architects, scientists, or CEOs. Would your HR department rush to find the first person who would willing to take on the role of Chief Scientist, Art Director, or CEO in your company? Of course not, they would spend the time to do a through talent search for just the right candidate, court them, and then compensate them appropriately. They realize that having the wrong person in that seat is much worse than having the seat empty. It is absolutely the same with programming. Experts use better tools and care deeply about their craft. They aren’t assembling bits on an assembly line, they are crafting a unique product to solve a unique problem. Experts are lazy, they work smarter rather than harder. Experts prefer the easiest solution that gets the job done. Experts aren’t interested in creating complex solutions simply to have the complexity, that misguided egoism is the territory of more junior developers. They often get it right the first try and almost always on the second one. At the California Mid-State Fair yesterday, when we were checking out all the livestock, I noticed a lot of unhappy kids hanging around. I learned afterwards that most of the kids we saw hanging about were the ones that raised these animals. Most of these livestock were going to be slaughtered the next day. That explained a lot. 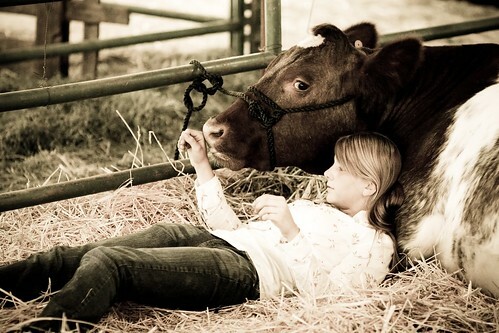 The girl hanging out with her cow I took a picture of (above) summed it up for me. Kids on a farm seem to learn life’s major lessons earlier. Thinking back, I felt pretty bad about the rest of the crowd (including us) that were swarming around and petting this cow as this girl was trying to quietly spend her last moments with the animal. Mankind’s fascination with flying goes way back (think Daedalus & Icarus). Yves Rossy takes this fascination to a new level.